150 mm L/55 SK C/281 х 2 pcs. 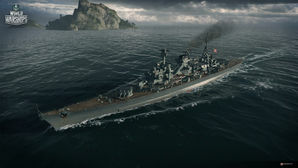 Roon — German Tier IX cruiser. Unlike her predecessor, the ship was larger in size and carried considerably reinforced AA armament. Moreover, she had more main battery guns that were arranged differently, resulting in the ship's artillery power being concentrated in the aft end. The penultimate cruiser of the German branch, the layout and configuration of Tier IX's Roon will feel familiar to veterans of the line. Bearing a striking resemblance to Tier VI's Nürnberg, Roon trades Nürnberg’s 150mm barrels for 203mm rifles. Indeed, Roon bridges the gap between her immediate predecessor — Admiral Hipper — and Tier X's Hindenburg as an almost perfect melding of the two ships. Roon initially carries over the same main battery guns as Hipper, but with an extra barrel in a very different configuration. Moving from double turrets to triples allows for more firepower to be concentrated into fewer turrets; this comes at the cost of losing one barrel forward in exchange for gaining two at the stern. Captains will need to return to the same style of play they developed in Königsberg and Nürnberg, hanging back at range for significant portions of a match and only closing when the situation favors them. Roon also has an upgrade module for the main battery that drops her reload time from 13 seconds to 11. This is a massive buff in her damage output and is worth spending Free experience on as soon as the ship is acquired, or, at a minimum, spending experience to unlock before Hull (B). Once fully upgraded, Roon has an anti-aircraft suite that is a small step above Hipper’s Hull (C), and is only a few steps behind American counterpart Seattle. Even without Defensive AA Fire ( ) equipped, captains who invest in an Anti-Aircraft Build will notice a significant increase in their effectiveness against enemy aircraft. She easily has the largest health pool of all (non-Premium) Tier IX cruisers, and with access to Repair Party ( ), Roon can take some punishment and hang in a fight far longer than Admiral Hipper veterans will believe. Like all of her German cruiser brethren since Tier IV, she has access to an improved version of Hydroacoustic Search ( ) that, when timed correctly, essentially makes her immune to long-range torpedo attacks. Roon has a few small drawbacks. With only one quadruple-tube torpedo launcher per side, her torpedo armament is notably worse than that of the cruisers before and after her in the line. While this is not a crippling defect, it does mean that she must choose her brawling opportunities carefully and not over-commit. She is the slowest Tier IX cruiser: more than capable of supporting her team, but incapable of running enemy destroyers to ground when the situation calls for it (a problem further exacerbated by her turret layout). Her base surface detection is also quite high; something that veterans of the branch will be familiar with by now, but a handicap that must be worked around all the same. Overall, Roon is a solid all-around cruiser with good firepower and above average anti-aircraft capabilities. She's a significant upgrade from Admiral Hipper and sets the table nicely for what captains can expect to find when they advance to Hindenburg. Excellent main battery performance: quick reload time, along with good range and dispersion. Armor is sufficient; turtleback scheme makes her resilient to citadels at close range, but leaves her vulnerable to plunging fire. Has access to the improved version of Hydroacoustic Search ( ) available only to German ships. Quick turret traverse time helps lower her broadside exposure when firing the rear guns. Highest health pool of all Tier IX cruisers. Fewer torpedo tubes than Admiral Hipper. If her lone frontal turret gets knocked out, playing Roon well is difficult. Main Battery: Upgrading Roon’s main battery module will increase her rate of fire and increase her turret traverse speed. Hull: Upgrade to Hull (B) for a significant boost to her health pool (+14%), a healthy increase in her anti-aircraft defenses, and improved rudder shift time. Research of this module unlocks progression to Hindenburg. Gun Fire Control System: Upgrade to FKS Typ 9 Mod. 2 for an extra 10% range on the main battery. Roon is one of the rare ships where the Hull (B) module should actually take a back seat to a different upgrade. In this instance, the improved Main Battery module is a much better place to invest early experience gains, as it improves both the traverse speed and reload time of the turrets. Hull (B) should come next, followed by the Fire Control System boost to her range. Virtually all builds of Roon find themselves mounting Steering Gears Modification 2 in Slot 4. After that, captains have some critical choices to make. Main Armaments Modification 1 is the recommended pick for Slot 1, though captains who choose to equip Spotting Aircraft ( ) may wish to install Spotting Aircraft Modification 1 ( ) in this slot instead. Captains with access to either Hydroacoustic Search Modification 1 ( ) or Defensive AA Fire Modification 1 ( ) are encouraged to plug those in Slot 2 depending on which consumable they opt to equip. Concealment System Modification 1 is the most popular pick for Slot 5 in order to help curtail her large detection radius; combined with a captain with the Level 4 skill Concealment Expert, her detectability range drops under 11.0 km. Conversely, Steering Gears Modification 3 ( ) is a strong option in the same slot for captains who prefer quicker rudder response. As the first ship of the branch with access to Slot 6, Roon offers captains some tantalizing options. The most popular is Main Battery Modification 3, which is a straight rate-of-fire buff to her main battery guns. Some captains prefer the additional range offered by Gun Fire Control System Modification 2 ( ), while still others prefer AA Guns Modification 2 ( ) to aid them in their quest to annihilate enemy aircraft. The upgrade in Slot 3 is largely dependent on how captains intend to invest commander skill points on Roon and the role they want her to fulfill in a given game. Anti-Aircraft Build: Roon’s already outstanding AA suite can be made even more potent by equipping AA Guns Modification 1 in Slot 3, and maximized by assigning a captain with Basic and/or Advanced Firing Training. This pair of upgrades provides excellent anti-aircraft protection for herself and teammates when utilizing Defensive AA Fire ( ). However, this does mean sacrificing the exceptional German Hydroacoustic Search ( ) and is a setup that is largely wasted in games without an aircraft carrier present. Roon prefers to hold opponents at arms' length, though she is quite well-equipped to close to point-blank range with enemy ships when the opportunity arises. High-tier German cruisers play — and handle — much like small battleships, and players will frequently find their commander skill choices echoing those popularly found on battleships: Priority Target at Level 1 and Adrenaline Rush at Level 2. Concealment Expert is also highly recommended at Level 4, as is Advanced Firing Training for captains pursuing an Anti-Aircraft Build. Level 4 also offers Manual Control for AA Armament to captains wishing to go all-in on their Anti-Aircraft Build. Roon’s generous health pool befits her heavy cruiser status and makes Damage Control Party II ( ) and Repair Party II ( ) easy recommendations to make. Her other consumable options are not as straightforward. The choice between Defensive AA Fire ( ) and Hydroacoustic Search ( ) in Slot 2 is captain's choice; those who have opted for an Anti-Aircraft Build commonly prefer Defensive AA Fire, but some captains stubbornly refuse to eschew the stellar German hydro in this slot despite the investment in AA defense. Roon is still well-capable of shooting down aircraft without Defensive AA Fire, but will not be able to screen her teammates from enemy bombers nearly as well without it. Similarly, the choice between Spotting Aircraft ( ) and Catapult Fighter ( ) is not lightly made. The Catapult Fighter helps enhance her anti-aircraft defenses and can potentially provide additional torpedo spotting help for captains who have chosen Defensive AA Fire over Hydroacoustic Search, while the Spotting Aircraft affords Roon captains windows where they can harass enemies at extreme ranges (when stacked with Gun Fire Control System Modification 2 ( ), Roon has a mind-boggling 24.8 km main battery range for the duration of the Spotting Aircraft). Whichever consumables are chosen for Slot 2 and Slot 3, captains are encouraged to equip the premium versions of them. In high tier games, the reduced cooldown on consumable charges can mean the difference between a good game and lots of credits, or a quick trip back to port with the corresponding economic loss. Players who wish to spend doubloons can equip Roon with Type 19 camouflage that lowers her detection radius, reduces the accuracy of incoming shells, reduces her repair costs, and increases the amount of experience she earns. Roon captains that are focused on progressing up the line will want to tailor her equipped signals to maximizing her experience gains. As such, Red Dragon ( ), Equal Speed Charlie London ( ), and Hydra ( ) all earn hefty recommendations. Sierra Mike ( ) will help improve her average speed, while Anti-Aircraft Build captains will want to throw on November Echo Setteseven ( ) as well. India X-Ray ( ) and Victor Lima ( ) are also recommended to increase the fire chance of her high explosive shells against angled cruisers and battleships. India Bravo Terrathree ( ) will help alleviate at least a portion of Roon’s high service cost. India Delta ( ) should always be flown to maximize her Repair Party ( ). Roon is largely a Wargaming-fabricated design made just for World of Warships. The only parts of her that have a historical basis are her turrets. Her triple 203mm/56 turrets were drawn up by Krupp in 1938, but any actual ship designs that would've used them were lost in the fall of Nazi Germany. Wargaming took the turret design and built the ship around them while taking heavy inspiration from the older Nürnberg-class. Being a fabricated design, this class was never actually planned and no blueprints exist of her other than the aforementioned turrets. Roon shares her name with the Imperial German lead ship SMS Roon as they are both named for Prussian general Albrecht von Roon. No ship in the Kriegsmarine was ever named Roon. The plans for the only historical aspect of the Roon, her turrets. Armor scheme. Note: This is based off of the ingame ship, not any actual designs. Weapons scheme. Note: This is based off of the ingame ship, not any actual designs. This page was last modified on 19 February 2019, at 09:13. This page has been accessed 78,371 times.